Saratoga Racecourse!! Town house 3 blocks from downtown shops & restaurants! 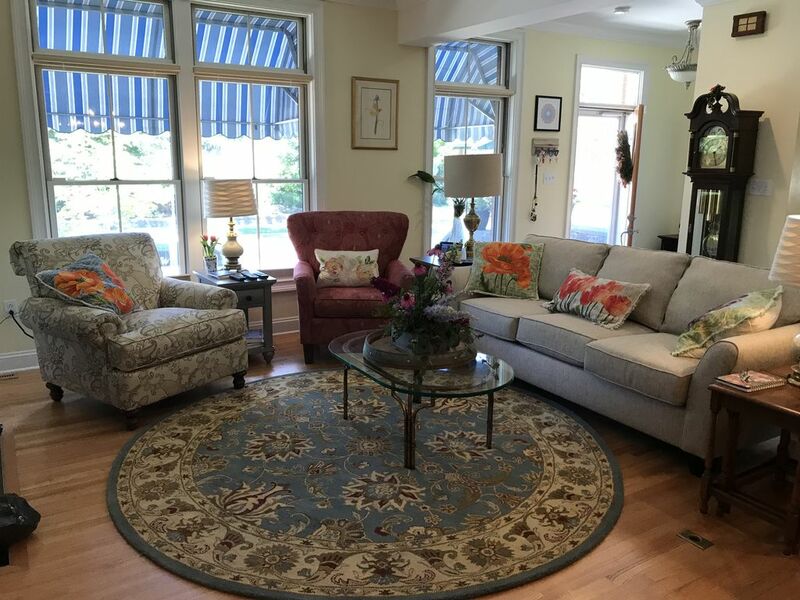 Beautiful 2 Story Townhouse located within walking distance to downtown historic Saratoga Springs restaurants and shops, thoroughbred race track, Farmers' Market, Spring Run Trail. Close to world class golf, Saratoga Performing Arts Center, Congress Park. 1/2 hr drive to Lake George, 1 -2 hour drive to many Adirondack and Vermont ski areas. Available for holidays including Christmas week, MLK weekend, President's week, Easter week, Skidmore College graduation weekend, and track season. 3 Levels of living space, 4 bedrooms, 3.5 ceramic tile baths, open floor plan. Radiant heat and forced hot air throughout. Zoned air conditioning. Eat in Kitchen with granite counter top, custom cherry cabinets, induction range with oven, dishwasher, microwave, coffee maker, espresso machine. Living Room with gas fireplace, HDTV, high speed internet/cable. Bedroom #3 queen sofa pullout, ceiling fan, balcony, 4 person hot tub. Family Bathroom with walk-in shower. Owner provides linens, towels, pots, pans, dishes, flatware. Renter provides food. We are a married couple in our early sixties. Our four adult children have moved to different areas of the country. We enjoy travelling and look forward to sharing our home in Saratoga Springs to like-minded folks. The proximity to downtown allows us to walk to restaurants and shops. toilet, combination tub/shower, Located on lower level. 5 blocks from downtown Saratoga Springs. Two sets of sheets for each bed. Gas fireplace in living room and master bedroom. Parking in front on the street. Two sets of towels for each guest. Use at your own risk. Concept 2 erg, free weights. Hamilton Beach Drip coffee maker. Mr Coffee Espresso maker. Conical burr bean grinder. Coffee filters. Dishes/utensils service for 8. Induction pots and pans. Balcony off second floor bedroom. Kayaks and paddle boards are available for rental at the Kayak Shack. Bicycles are available to rent from local vendors. Boating is permitted on Saratoga Lake. There are several marinas nearby that can provide additional information. Lake George is a half hour drive north. West Mountain is 20 minutes north. Gore Mountain is 55 minutes north. Rental equipment is available at both locations. Cross country skiing and ice skating available at the Spa State Park. Hard tru tennis courts are available in Spa State Park and are open to the public, first come first serve. Hard courts, also public, are available at the East Side rec, on Lake Avenue. Golf courses at the Spa State Park are open to the public. Nearby private clubs are within driving distance, and include MacGregor, Saratoga National, and Brookhaven. Spa State Park has two communal pools: Victoria Pool, near Catherine's and Peerless Pool, which includes sliding board and playground. We are located in a four season resort town. Minutes from Saratoga Lake, 1/2 hour from Lake George for water activities. Winter activities include cross country skiing and ice skating at the Spa State Park. Several ski resorts are available within a two hour drive. The location is fabulous. The house was stocked with absolutely everything we needed. It was so comfortable for 8 people. The hot tub was actually an unexpected benefit that we thoroughly enjoyed after a long hot day at the track. We will definitely rent it again next year and highly recommend it. Thank you for your comments! We love Saratoga and are happy to hear our guests enjoy their stay with us! We stayed at this lovely home for a girls weekend. The owner greeted us upon arrival and was so helpful in recommending local restaurants and things to do. This was within walking distance to Broadway Street where all the shops and restaurants are located. I wish we had stayed longer than a weekend. We rented this property for my daughter's graduation weekend from Skidmore. The property was great. The house is in pristine condition and the owners put a lot of attention to detail in many of the amenities they left around the house, from a very lovely basket filled with goodies, to guiness on tap, which my husband got a big kick over! The townhouse is in a very convenient location, about a 10 minute walk to town but also very close to Skidmore. We even hosted a small catered graduation dinner and the owners couldn't have been more accommodating, leaving us extra chairs for guests to sit on. Great property, we couldn't have asked for more! Great home, great location, great space. Christy was very responsive and accommodating. Highly recommend. You'll feel right at home in the historical town of Saratoga Springs. Located only 35 miles north of the state capitol of Albany, you will find numerous entertainment options, and quality public services. Saratoga Springs is rich is history, with a number of museums, including the National Museum of Racing, the National Museum of Dance, and the Saratoga Automobile Museum. Saratoga Performing Arts Center (SPAC), with its impressive outdoor amphitheater, is the summer home to the NYC Ballet and the Philadelphia Orchestra. The Saratoga Spa State Park and its unique architecture features two exciting golf courses, two outdoor swimming pools, cross country skiing, ice skating, biking and jogging paths. The beautifully landscaped Congress Park hosts famous springs and the Historic Canfield Casino. The mineral springs, located throughout the park and the area surrounding the park, are open for public tasting. Saratoga Race Course holds the six week summer meet and attracts top horses, jockeys and trainers. Numerous shops, vibrant night life with restaurants, bars and cafes provide great venues for every taste.